My regular readers may remember the post on square arechea. 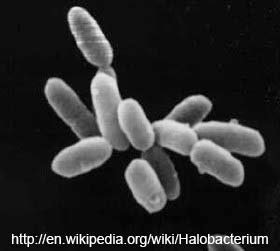 Today I am posting another species of Halobacteria, Halorubrum lacusprofundi . Halobacteria are a class of archea. This may seem confusing as their name contains the word bacteria, which are completely different from archea. For this reason they are usually referred to as Haloarchea. Halorubrum lacusprofundi lives in water which is saturated or close to saturated with salt, a very hostile environment for most living things on Earth. They are named after Deep lake in Antarctica where they were found. Deep lake gets to temperatures of -20 degrees Celsius. Hang on, you're probably thinking, wouldn't the lake freeze over at those temperatures? This lake doesn't because it is so salty the freezing point is significantly lower than normal. The lake contains an average of 27÷ salt. Oddly enough the highly specialized Halorubrum lacusprofundi was not the only microbial species to be found in this ridiculously hostile environment. Several other species including some algae were found, but I chose to write about this one as it is named after the lake (lacusprofundi meaning deep lake). 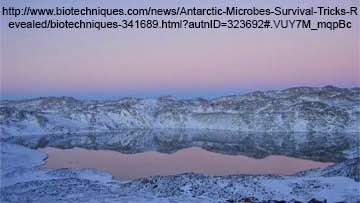 As far as I can tell Halorubrum lacusprofundi has only been found in Deep Lake, Antarctica.